Celebrate National Peanut Butter & Jelly Day April 2nd, with this one easy, healthy upgrade to your daily diet. 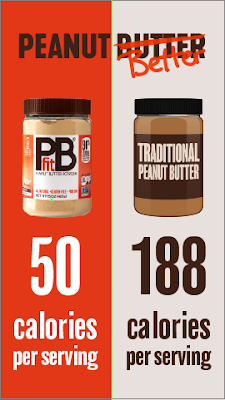 PBFit offers 90% less fat and 1/3 the calories of traditional PB and tastes great!! It even comes in chocolate! PBfit is a healthy alternative to traditional peanut butter—it’s a powdered peanut butter that you can mix right into your smoothies or recipes. With a dash of organic coconut palm sugar and salt, Pbfit lets you keep the nutrients, along with the peanut butter taste you love, but lets you ditch the fat and calories.